Sources from All Things Digital who claim to be familiar with the situation have reported that Facebook is entering in a deal with Skype very soon and that the teaming-up is already come through. 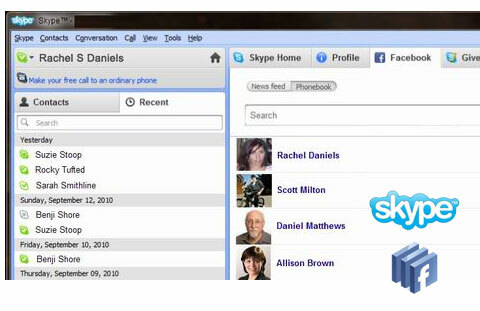 Skype 5.0 beta is coming out in the next few weeks and it will be bringing Facebook integration with it. This will include SMS, voice chat and calling Facebook friends directly from Skype. Users will be able to log in to their Skype accounts with their Facebook credentials and video chat using Facebook inside Skype. This will be a major boost for Skype as a large number of Facebook’s 500 million users will access Skype for the first time, adding to Skype’s 124 million strong user base. Facts and figure prove that an average user spends more time on Facebook than other domains and it makes sense for services like Skype to be available on such a platform. Facebook is also reported to be entering in a massive deal with Yahoo and Microsoft, very soon. It will be interesting to see if both Facebook and Skype cross-integrate into their popular mobile apps too.